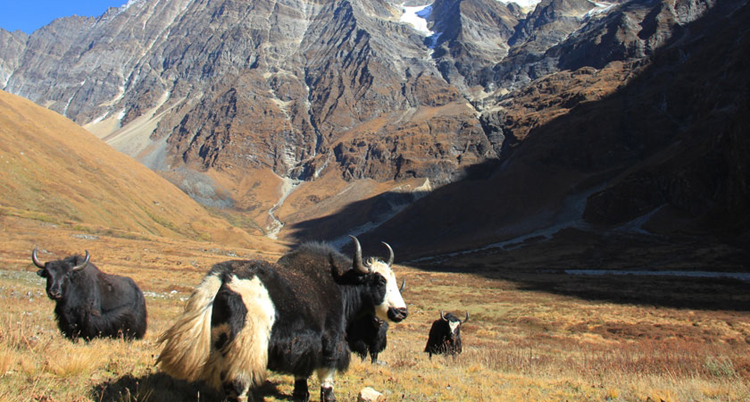 The trekking trail from upper Dolpo to Jomsom winds around the remote region of Nepal instead of following the most frequent Dolpo circuit. 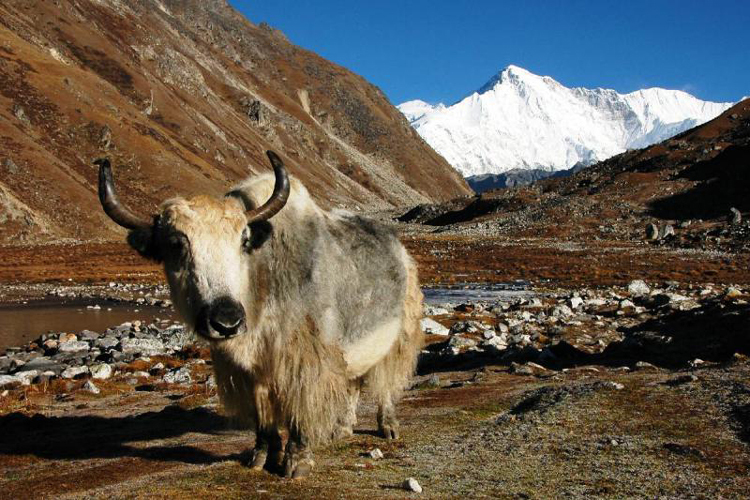 We will be walking through the area very near to Tibetan border and then walk out on the challenging trail to Jomsom thereby completing the trek.Dolpo protected by Shey Phoksundo National park is situated in the mountain region of Nepal covering the parts of Dolpo and Mugu districts. Established in 1984, it is the largest national park of the country covering the area of 3555sqkm. The trek begins by walking through the pristine pine and cedar forest with the astonishing view of Dhaulagiri massif in the backdrop. 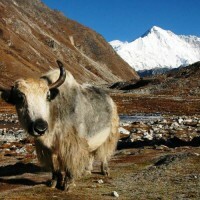 The trek is quite long and introduces to the most beautiful, remote, isolated and culturally vivid areas of the country. Pashupatinath temple which is situated 5km east of Kathmandu in the bank of holy Bagmati River. Pashupatinath is a pagoda shaped temple with tiered golden roofs and silver doors. Only the Hindu’s can visit the temple, but the visitors can clearly see the temple and activities performed in the temple premises from the eastern bank of Bagmati River where the dead bodies are cremated. From here we will visit Boudhanath Stupa which is located 8km east of Kathmandu. Boudhanath stupa is dome shaped monument representing the mind of Buddha and pilgrimage destination for Tantric Buddha. . In the afternoon we will drive to Patan Durbar Square which is situated in the southern area of the city. The square is dotted with ancient palaces,temples and shrines which are known for their antique and exquisite carvings. From here we will proceed to Kathmandu Durbar Square which is the historic seat of Nepalese royalty. Here we will visit Kastamandap Temple (a temple rumored to be constructed from the wood of single tree), Taleju temple, statue of Kal Vairab, Basantapur palace and Kumari Temple (residence of living goddess Kumari). After this we will pay our visit to Swoyambhunath temple which islisted in UNESCO World Heritage Site. The temple dates back to 2500years and is situated in the hilltop offering the astonishing view of Kathmandu. Return back to hotel for overnight stay. After having our lunch we will take an hour flight through the Himalayas to Nepalgunj. While flying you will left with awe with the magical panorama of Langtang, Manaslu, Annapurnas, Dhaulagiri and Dolpo. Nepalgunj is situated close to Indian border and is quite hot. Stay overnight at hotel in Nepalgunj. We will take a morning flight from Nepalgunj to Juphal. Jupahl is a small village with few shops, guesthouses and lodges. The houses here are influenced by Tibetan style. 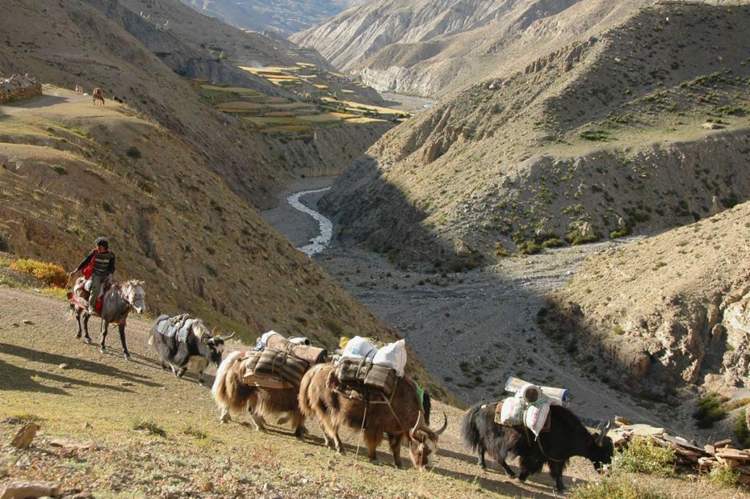 From Juphal we will commence the trek to Dunai which will takes around three hours. The path from Juphal to Dunai goes through several villages, grassland and terraces. 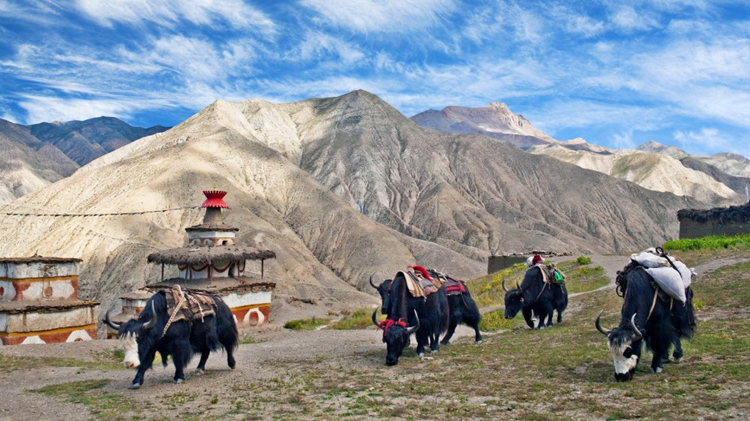 Dunai is the districts headquarter of Dolpa and surrounded by green hills. From Dunai the trail continues through the forest of Pine, Oak, Juniper, Rhododendron and Bamboo to our camping site in Chhepka via Raktang(2260m). Day 5: Extra day in case of any delays flying to Juphal. Day 6: Trek to Amchi Hospital (3110m). 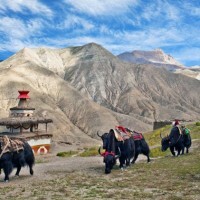 Day 7: Trek to Ringmo and then to Phoksundo Lake (3,700m). Today we will take a rest at Phoksundo Lake and explore the area. Today we will be visiting monastery and go around the village to witness and experience typical lifestyle of the local people. From here one can enjoy the panoramic vista of Kanjelaruwa Peak (6612m), Tso Peak (4716m) along with many others. Day 9: Trek to Phoksuno Lake North Camp (3630m). Day 10: Trek to Lar Tsa Camp (4200m). Today we will make our way to Shey Gompa and nearby Crystal Mountain which is regarded as the most sacred peak in Dopo region via Kang La pass (5240m). 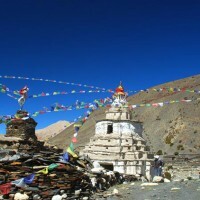 Today we will explore Shey Gompa. 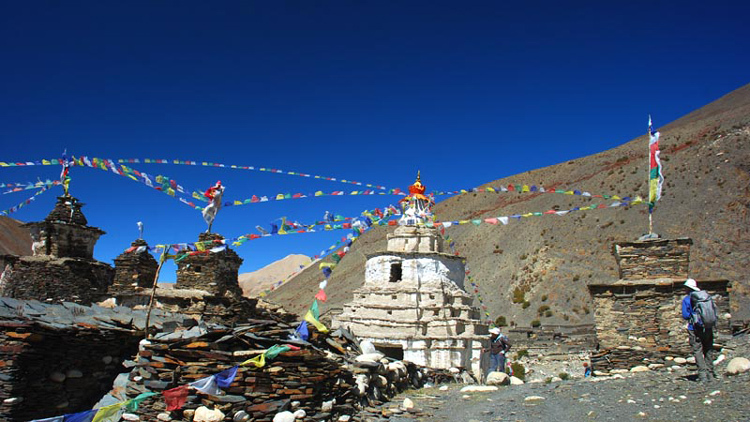 The history of Shey gompa dates back to 800 years with murals inside and an ancient scroll describing the mythology behind the crystal mountain locally called Riu Dhukta and the gompa. Leaving Shey Gompa behind us we will cross Seldang La pass west of Shey, we are welcomed with the astonishing vista of Mustang to the east, Tibet to north and Kanjiroba, Kagmara and Riu Dhukta to the west. Stay overnight at Namgung, a local nomadic herding settlement. 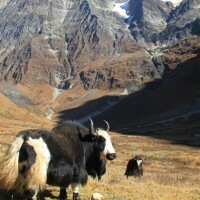 Day 15: Trek to Dora Sumda(3770m). Day 18: Trek to Tinje Village (4180m). Day 22: Trek to Norbulung(4750m). Day 25: Trek to Dhagarjun (3280m). 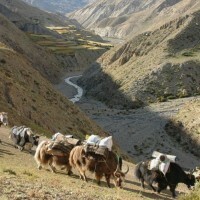 Day 26: Trek to Jomsom. Day 27: additional day if there is some technical delay in the trek. Day 28: Fly to Pokhara and then to Kathmandu. Upon arriving Kathmandu check into the hotel. Today you can either take rest or explore the city on your own or do some family shopping. Stay overnight at hotel in Kathmandu.